Fed cattle swooned in July; what’s the outlook? The July fed cattle market held the line in spite of strong volatility. Will August fed prices hold on too? Holding the line: that’s the July market story. And to that end, successfully holding on was especially important considering June’s market action. Recall that fed cattle prices began June with two weeks of back-to-back trade at $136. But the decline from there was sharp and swift. The market gave up $16-$18 in just three weeks. Feedyard managers subsequently sold cattle at $118-$119 to end the month. Given that trend, the market held a negative bias going into July. However, the fed market managed to fight off that bias and remained surprisingly resilient through the month. July fed cattle trade was been mostly steady, ranging between $117 and $120. And August started on a solid note with cattle trading mostly $116-$118 (Figure 1). The fed market’s resilience is especially significant amidst softer prices on the wholesale side. The Choice cutout weekly average finished June near $231, when cattle traded at $118-$119. But during the next four weeks, the cutout retreated about $24 to finish July at $207. 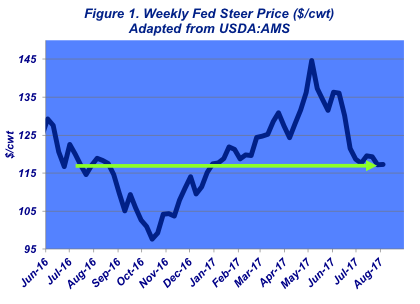 All the while, feedyards managed to hold fed prices steady. So that staying power has to be interpreted as a major victory for cattle feeders. What about August and beyond? The main question now revolves around whether or not that resilience can prevail through the rest of the summer. In other words, will the market take a turn for the worse in the coming weeks? Action at the CME indicates that feedyards are fighting a tough battle and need things to turn in their favor. The August live cattle contract has been under pressure in recent weeks. More important is the extended outlook. And that’s not been good: there’s a negative bias to the market for the foreseeable future. The October and December futures have now sliced through $110. Clearly, given the extended outlook, that can change – especially as we look into spring 2018. However, cattle feeders will have some work ahead to advance the market in a meaningful way. That slog is primarily the result of bigger placement numbers. USDA’s Cattle on Feed report was interpreted as decidedly bearish because of feedyard arrivals that were well ahead of expectations. 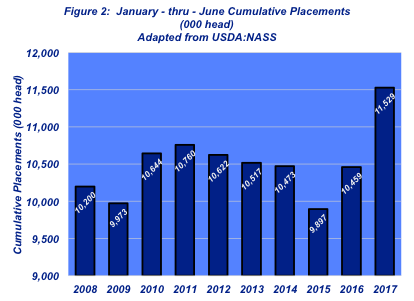 June placements equaled 1.77 million head – 16% bigger than last year and 15% ahead of the five-year average. But that’s been the case all year. Through the first half of the year, total placements equal 11.53 million head. That pace represents nearly 1.1 million head more than 2016 and the biggest six-month run since 2003 (Figure 2). Aggressive placements are the direct outcome of favorable closeouts. 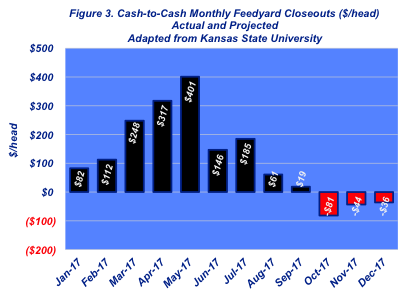 Kansas State University estimates of cash-to-cash closeouts are solidly positive through the first eight months of the year. And in this business, positive cash flow rarely goes toward building cash reserves; rather, it gets rolled into the next turn of replacements (Figure 3). That reality has been solidly supportive for the feeder market. 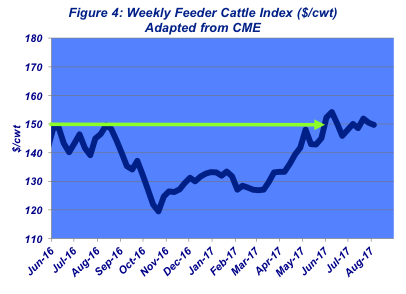 The CME Feeder Cattle Index has been running consistently around $150 for several weeks. And during the past several months, feeder prices have jumped ahead of last year’s level. For example, through May, the CME Index averaged about $22 per cwt behind 2016 on a year-over-year comparison. That’s since changed: for the first time this year, feeder prices in June and July are averaging $6-7 ahead of last year’s summer market (Figure 4). Meanwhile, there’s been quite a bit of coverage around USDA’s mid-year Cattle Inventory report. USDA reported 32.5 million beef cows inventoried as of July 1. Unfortunately, there was no report last year – thus, there’s no meaningful year-over-year comparison. Typically, the mid-year report provides some insight into decision making around expansion (or lack thereof). Given the absence of a 2016 report, the best alternative indicator are cow slaughter trends. Last week’s Industry At A Glance featured beef cow slaughter through the first half of 2017. Thus far, it appears beef producers have indeed reached somewhat of an equilibrium point in terms of cow inventory; growth is occurring, albeit at a very tepid rate. The coming months could change all that, but thus far it appears we’ll end up with a Jan. 1, 2018 inventory similar to 2017, with a bias toward slightly larger numbers. Clearly, news around Japan’s increased tariff rate isn’t immediately favorable. Time will tell how price-sensitive buyers are regarding U.S.-sourced beef supplies. Alternatively, though, the development can be favorably interpreted: the higher tariff is the result of positive demand for high-quality beef in the Japanese market – and over the long-run that ultimately favors U.S. beef producers versus other countries. With that in mind, despite seasonally softer prices versus the spring high, the market remains surprisingly steady – much of that driven by positive demand, both foreign and domestic. Moreover, price volatility has been somewhat muted in recent weeks. That said, there’s work to do going forward – marketings need to remain active to prevent the feeding sector from becoming uncurrent. As always, readers are encouraged to ensure they have access to objective, insightful information while practicing discipline to analyze that information. Beef producers are always encouraged to ensure they understand all sources of risk going forward, especially in good times. Investment of time and energy into that endeavor is highly valuable – it helps to ensure the likelihood of making sound and timely business decisions going forward.